Send online this special gift of Exotic Gift Combo of Attractive Treats and make others feel special on this Diwali. 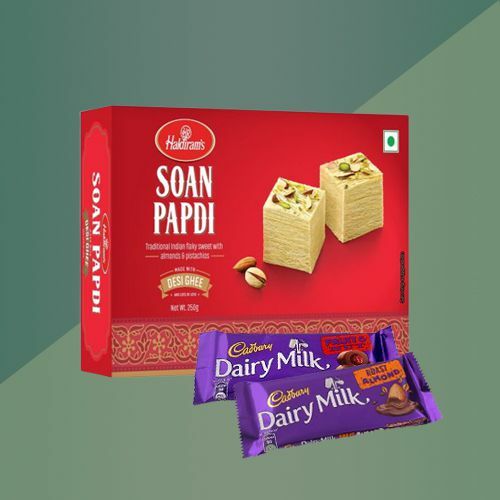 This Gift Combo is comprised of Haldirams Soan Papdi (250Gms), Cadbury Dairy Milk Fruit and Nut Chocolate Bar, Cadbury Dairy Milk Roast Almond Chocolate Bar and Wax Diyas (6Pcs). Flowers Delivery Rourkella, Send sweets Phagwara, Wedding Cake Pune, Diwali Mithai Gwalior, Send Flowers and Gifts to Manipal, Online Shop Thanjavur, Flower to Vishakhapatnam, New Year Flowers Miraz , Fresh Fruits Srikalhasti, Send Gift Mhow, Dry Fruits to New Delhi, Birthday Delivery Tatanagar, Sending to Amravati, Flower shop Faridabad, Solapur Online Cake Delivery.